On the last day of Milan Fashion Week (September 25, 2018), breaking news emerged from the runway: the Versace family has agreed to sell its company to the American fashion designer Michael Kors for 2.1 billion dollars. The deal, which marks the end of the independence of one of the most illustrious Italian fashion brands, is the biggest effort yet by the multinational fashion company Michael Kors Holdings Limited to consolidate its presence in the global luxury market. Michael Kors Holdings Limited [NYSE:KORS] was founded by the American designer Michael Kors in 1981 and sells clothes, shoes, watches, handbags, and other accessories. It grew exponentially until 2011, when it was listed on the New York Stock Exchange. The IPO was a big success and the share price jumped from the initial $20 to nearly $100 in 2014 as sales were growing at a double-digit rate. By 2016, annual revenues reached $4.71 billion, with a net income of $840 million. Last year, in order to move towards the higher end of the luxury market, the company bought the shoe brand Jimmy Choo for $1.2 billion, marking the first step in its expansion plan, soon followed by the purchase of Versace. Once the deal with Versace is completed, Kors said, the company will change its name to Capri Holdings Limited, inspired by an "iconic, glamorous and luxury destination" island, as it develops its multibrand luxury strategy. Gianni Versace S.p.A. is an Italian luxury fashion company founded by the legendary designer in 1978, famous all over the world for carrying the Medusa logo on all of its products. The main collection of the brand is Versace, which produces upmarket Italian-made ready-to-wear and leather accessories, while other diffusion lines are Versace Collection (mainly in the US), Versus Versace (aimed at a younger public) and Versace Jeans (a line of perfumes). The company was first run by Gianni himself, who became famous for serving celebrities such as Elton John and Michael Jackson. After his tragic death in 1997, his sister Donatella Versace, formerly vice-president, took over as creative director and his older brother Santo Versace became CEO. In February 2014 Blackstone purchased a 20% stake in Versace for €210 million, valuing the company at €1.05 billion. The Private Equity firm’s plan was to fund Versace’s expansion abroad, increase its revenues and eventually prepare the company for an IPO. This strategy, however, failed and Blackstone basically refused the IPO, saying that markets conditions were not convenient at all. Since then, Blackstone gradually persuaded the family to look into a possible sale and introduced the company to a series of buyers, including Michael Kors, because it was not intentioned to invest any more money into it and therefore needed a buyer willing to make high investments. Michael Kors acquired Versace for $2.1 billion, bringing the American company closer to its goal of becoming an international house of fashion brands. “The acquisition of Versace is an important milestone for our group”, Michael Kors CFO John Idol said in a statement. “We are committed to investing in its growth”. The company’s plan indeed, is to increase Versace’s sales to $2 billion annually (more than double the current level), expanding the number of stores from roughly 200 to 300 globally over the next 5 years and improving e-commerce development. It also expects to intensify accessories and footwear from 35% to 60% of revenue. Versace not only will add high-end couture credibility and heritage to Kors, but also extravagance and splendour thanks to its baroque designs, brash prints and vibrant colours. As part of the deal, Donatella Versace, who has helped run the company since the death of his brother, will remain in order to oversee the label. Donatella, together with her brother Santo and daughter Allegra, will also stay on as shareholders in the company. Jonathan Akeroyd, currently Versace’s CEO, will continue to lead the management team. The deal marks one of the first times an American company has cracked the code of super high-end luxury fashion, typically controlled by Kering, the owner of Yves Saint Laurent and Balenciaga, and LVMH, the owner of Guerlain and Givenchy. 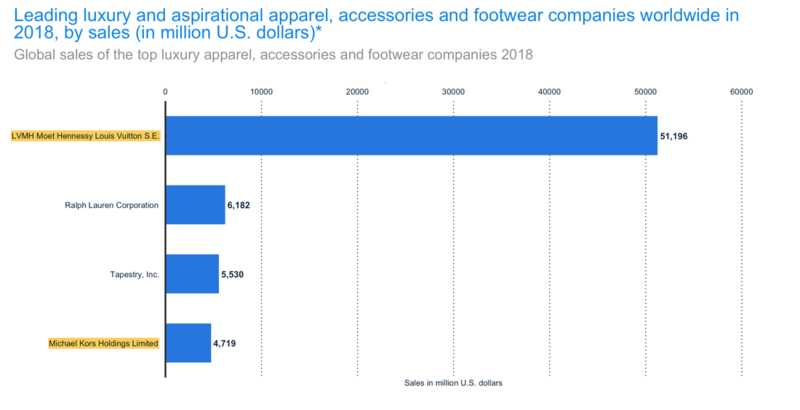 While the number of sizable U.S. brands to acquire has decreased, the European luxury market has become rife with opportunity. Indeed, a number of businesses, like Prada and Giorgio Armani, have been turning up on wish lists for luxury retailers. ​Michael Kors said that following the deal, the company hopes to reduce its proportion of business in the Americas from 66% to 57%, while increasing its European business from 23% to 24% and Asian from 11% to 19%. The push further into luxury serves also as a defence for the next economic downturn, more than a decade after the last one in the U.S. Those who can afford a Versace dress are among the most likely to continue to spend during a recession than those who shop more affordably, industry experts say. Overall, the deal was negatively perceived both by investors and dedicated fans of Versace brand. On 25th September, the announcement date, Michael Kors shares fell down by nearly 10%, which equated to a loss of nearly $1bn of market cap. The company’s shareholders indeed fear that such a luxurious brand as Versace might lose a lot of its exclusive aura when acquired by Kors who is still a premium brand, but sells cheaper products. Moreover, Versace has been criticised by the Italian press for not selling to an Italian company. However, Donatella Versace hit back at those claims in an interview with Corriere della Sera: "In the last year Versace has been approached by many people. French, American... but no Italians. It was not us who refused to take part in an Italian group," she said to the newspaper. JP Morgan and Barclays advised Michael Kors on the deal, while Goldman Sachs acted as sole financial advisor for Versace. Blackstone instead was advised by Lazard.